Join Holy Family's Catholic Youth Ministry and Young Adult Ministry on Good Friday, April 19, at 7 p.m. for our annual Living Stations of the Cross. This Living Stations of the Cross animates each station to draw you deeper into the mystery of each part of Jesus' Passion and Death. It ends with veneration of the cross as we ponder Jesus being in the tomb. Admission is free, and the entire parish is invited. 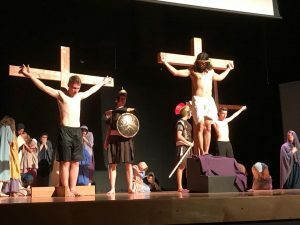 If middle-schoolers, high-schoolers and young adults wish to take part in the Living Stations of the Cross, please contact Gayle Zambito at gzambito@holyfamilyorlando.com or speak to her at Spark, Ignite or YAM Sundays. Rehearsal dates TBA. Note that adults who take part in this presentation will need to meet diocesan requirements for volunteering with youth.